To be more productive, faster, and more efficient when performing financial analysis or research it’s important to be proficient at using the Bloomberg Terminal, and that means knowing the most important Bloomberg functions. Whether you work in investment bankingInvestment Banking Career PathInvestment banking career guide - plan your IB career path. Learn about investment banking salaries, how to get hired, and what to do after a career in IB. The investment banking division (IBD) helps governments, corporations, and institutions raise capital and complete mergers and acquisitions (M&A). Analysts work 100, equity researchEquity Research AnalystAn equity research analyst provides research coverage of public companies and distributes that research to clients. We cover analyst salary, job description, or other areas of the capital markets you’ll have to learn how to use the Bloomberg Terminal for grabbing historical financial information about a company, share prices, transactions, bonds / fixed income information and much more. 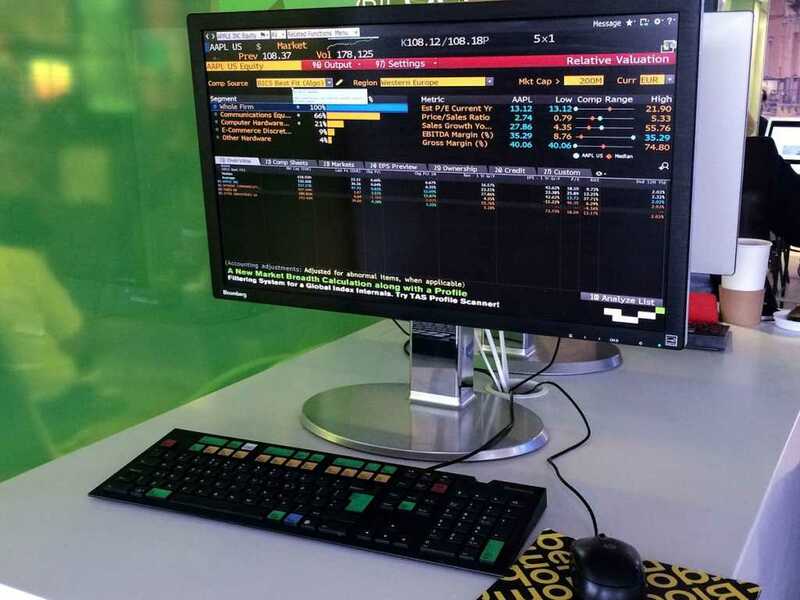 Here we have compiled a list of what we believe are the most common and important functions, keystrokes and shortcuts to know on the Bloomberg Terminal inside out. Bloomberg mastery is key to becoming a great financial analystThe Analyst Trifecta® GuideThe ultimate guide on how to be a world-class financial analyst. Do you want to be a world-class financial analyst? Are you looking to follow industry-leading best practices and stand out from the crowd? Our process, called The Analyst Trifecta® consists of analytics, presentation & soft skills. Allows you to monitor and compare real-time price and volume data for the world's equity indices. WPE World P/E Allows you monitor and analyze key fundamental ratios, such as price/earnings, across major equity indices and compare intra-day index level ratios against analyst estimates and other regions. Economic calendars of real-time andupcoming economic releases, commodity, government, central bank and industry data, and events. Provides economic data with organization and context and allows to analyze multiple datasets using graphical and table formats. Shows stocks that drive the movement of a selected index or other equity group. Allows tracking and analyzing mergers and acquisitions data in real time and easily filter for deals by a range of dimensions, such as deal type, size, and adviser. Also allows finding deal-level data. Additionally, allows searching for comparable transactions. Gives an overview of currency rates in real time, also provides information on pricing hours for better monitoring. Allows monitoring cross currency spot, forward, and fixing rates. Displays a list of current and historical credit ratings for up to 10,000 issuers, allowing to track upgrades, downgrades, and other moves that reflect the issuer's fiscal strength and degree of risk. Shows all major rates, securities, and economic releases for a selected country. Provides current interest rate swap rates, along with government, agency, index, Libor, and futures markets rates, plus economic statistics. Fixed income electronic trading platform for U.S. rates and a broad set of global sovereign debt. Monitor and chart sovereign bond yields, spreads, and historical performance on one screen, along with current yields, spreads and current rates' statistical deviation from averages. Shows when markets are open/closed and when they are operating on a partial day schedule. Displays a menu of real-time global money market rate monitors for comparison against composite prices, third party prices, and electronic trading prices. Create customized lists of loans, government and corporate bonds, structured notes, municipal bonds, and preferred securities from the Bloomberg database. Alows to search for curves, filtering by asset class, and country/region and/or sector. Monitor U.S. municipal bond market offerings, bids wanted, and reported transactions in one place. Sub-platform that provides research on industries, companies, and expert topics, delivering key data and interactive charting. Displays different trading activity performance metrics of a specified security, such as Volume, Chg Up, Chg Down, Value, Delta AVAT, 52Wk Highs and 52Wk Lows. Allows comparing the returns and monitor the performance of a list of funds over a given period, and filtering by country, fund type, sector, and fund family name. Allows monitoring equity offerings by stage, region, industry, and other criteria. Allows configuring service default settings all in one screen, including country/region, primary and secondary exchanges, news sources, and other defaults. Consolidated financial information for a specific financial instrument, such as a bond, loan, swap, index, futures contract, stock, warrant, option, fund, money market program, currency, or preferred security. Displays company management information about top-ranking executives and board members for a selected security. Filtered view of the News (N) function for a loaded security. Displays the issuer description in the Security Description (DES) function for bonds. Provides a comprehensive overview of a security's issuer, including company description and fundamentals, debt obligations, equities, and related financial instruments. Provides comprehensive financial information for a company, including historical fundamental data and future estimates, as well as aggregated fundamental data for global equity indices. Displays a history of a company's distributions. History includes cash dividends and other distributions, such as stock splits. Allows for comparison of historical announcements for the stock against consensus estimates. Provides a snapshot of aggregated broker earnings projections, surprise earnings data, and a summary of earnings history. Filtered view of the Graph Fundamentals function (GF), allowing for visual comparison of a company's fundamentals with those of other companies, indices, commodities, and economic data. Provides comprehensive earnings trend analysis for a selected equity, including an annual and quarterly breakdown of actual and estimated earnings trends. Shows analysts recommendations for a selected equity and allows for monitoring of changes in opinion and analyzing the quality of analyst predictions. Menu that allows searching for holders whose trading activity may influence the price of a selected security. Allows for analysis of credit worthiness of a debt issuer or specific fixed income security by displaying both current and historical credit ratings from different ratings agencies in one screen. Displays a calendar of corporate and municipal actions for a single security, including events such as stock buybacks, capital changes, and distributions. Corp Filings – SEDAR/EDGAR Provides access to publicly available filings for research purposes. Visual time series analysis tool used to evaluate a security's intraday price trends for a period of up to 240 days. QR displays a quote-by-quote and trade-by-trade history for a selected equity. Povides detailed quotes, valuation and earnings ratios, peer activity, consensus forecasts, past performance trends, and related news headlines for an equity, equity option, or fund. Provides broker activity summaries for exchanges, preferreds, equities, commodities, futures, warrants, REITs, funds, ETFs, and bonds. Displays the Top Trades in the Price and Volume Dashboard (VWAP) function. Displays the Volume at Price tab in the Price and Volume Dashboard (VWAP) function. Displays the Trade Summary Matrix tab in the Price and Volume Dashboard (VWAP) function. Provides real-time pricing, market data, and derived data for exchange-traded call and put options for a selected underlying security in a customizable screen. Allows performing relative valuation analysis on a security against comparable companies or examining the relative richness/cheapness of a bond. Allows comparing of returns of a selected security to up to five other selected securities, including its benchmark index and industry group (if available). Allows for calculation of the total return for a security over a specified period of time, using criteria such as price at horizon, commissions, and reinvestment rate. GP and its related charts (GPC, GPO, GPF, GPL) and study functions (RSI, MACD, BOLL) are visual time series analysis tools used to put financial data into context. Displays the open/high/low/close chart view of the Price Chart (GP) function. Displays a security's price, yield, and/or volume plus the close, open, high, and low prices. The historical price table shows pricing and volume data for a security over a specified period of time. Allows reviewing short interest information for equity securities that trade on certain exchanges. Allows you to create and organize all of your custom charts. Displays the simple, annualized, and semi-annualized price appreciation of an index for 20 different time periods. Allows analysis of the stocks that drive the movement of a selected index or other equity group. Ranks the members of an equity index, basket, or portfolio by price appreciation or total return. Displays the members of an index and its current weightings, along with shares and price performance. In addition to using Bloomberg functions on the Terminal, analysts also have to be good at integrating Bloomberg into Excel. Analysts will often build custom formulas that pull data directly from the Terminal to their desktop where it can be integrated into financial analysis, financial modelingWhat is Financial ModelingFinancial modeling is performed in Excel to forecast a company's financial performance. Overview of what is financial modeling, how & why to build a model. A 3 statement model links income statement, balance sheet, and cash flow statement. More advanced types of financial models are built for valuation, plannnig, and and valuation work. Below is a screenshot of the Bloomberg TerminalBloomberg TerminalThe Bloomberg Terminal is a popular and powerful tool for finance professionals around the world. Analysts in investment banking, equity research, and. Analysts are expected to be efficient at using the Terminal and need to quickly be able to pull information. The most common professions to use this data provider are investment bankingWhat do Investment Bankers do?What do Investment Bankers do? Investment bankers can work 100 hours a week performing research, financial modeling & building presentations. Although it features some of the most coveted and financially rewarding positions in the banking industry, investment banking is also one of the most challenging and difficult career paths, Guide to IB, equity researchEquity Research OverviewEquity research professionals are responsible for producing analysis, recommendations, and reports on investment opportunities that investment banks, institutions, or their clients may be interested in. The Equity Research Division is a group of analysts and associates. This equity research overview guide, and sales & tradingSales and Trading Career ProfileThe sales & trading division (S&T) of an investment bank helps mutual funds, hedge funds, pension funds, etc. facilitate equities transactions (buy/sell). A career in sales & trading can be extremely strenuous with a very fast paced environment. The competition for positions is intense, compensation can be very high,. Beyond this list of Bloomberg functions, there are many more tools at your disposal at CFI to become a world-class financial analyst. CFI is the official global provider of the Financial Modeling and Valuation Analyst designation. IBES estimatesIBES EstimatesThe IBES or Institutional Broker’s Estimate System is a database created to provide forecasted future earnings of companies that are publicly traded.